WHITE PAPER BUILDING A UNIQUE BUSINESS SPACE WITH A CONTAINERISED SOLUTION With property leases amounting to as much as 8% of gross revenue within many industries, smart businesses are increasingly looking for alternatives to traditional bricks and mortar. One fast growing trend is the adaption of shipping containers to create unique and innovative building spaces for offices, hospitality, retail, services industries and more. 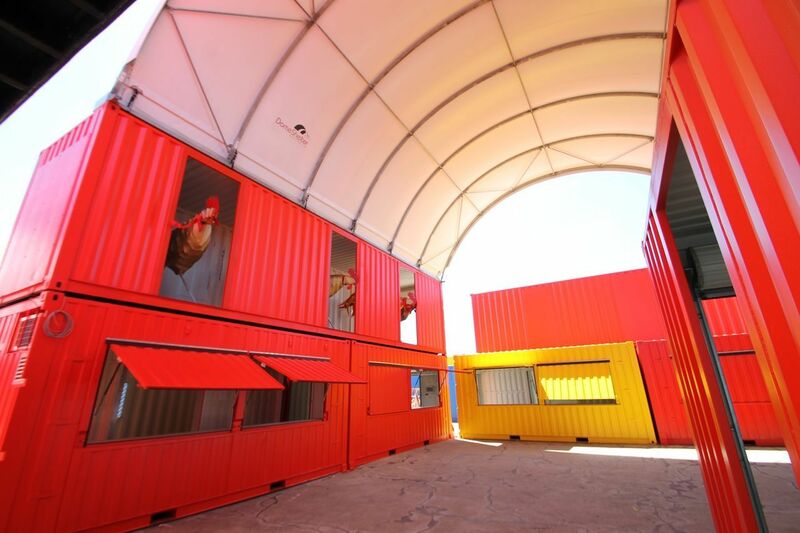 In particular, containers are proving to be the ideal solution for temporary pop-up businesses and events. There are four primary advantages of using shipping containers for building space – portability, flexibility, speed of installation and cost. While this may be unexplored territory for many people, armed with some basic information, it is easy to create a secure and safe business space with very few pitfalls. All shipping containers are made from heavy gauge, corrosion resistant Corten steel. There are different grades of container depending on past usage so it is vital to ensure that containers used for buildings are wind, weather and vermin proof. Most reputable container providers repair and maintain used shipping containers after every hire but near new containers provide the best solution for pop up businesses. The easy portability of shipping containers makes them ideal for temporary usage even in remote areas. There are three potential delivery methods to transport a container to your site: via tilt tray truck, side loader truck and crane truck. Tilt tray truck delivery suits many locations; the container is simply loaded onto the truck in the direction to be in the correct position once unloaded. Where the container needs to be delivered within a confined area, side loader truck delivery is a practical option. Again, it is important to consider which way the container will be positioned when loading it onto the truck as it can only be unloaded from the right hand side. If neither tilt tray or side loader truck delivery are suitable due to access issues and obstructions such as fences, delivery is still possible to most sites using a crane truck. Standard shipping containers can often be delivered within just 24 hours of ordering. You may need to do some basic preparation work on your site such as levelling the surface or removing overhanging branches but often the containers can simply be placed on sleepers or concrete pads. In some areas, containerised buildings don’t require a development application but it is essential you check the regulations with your local Council as requirements do vary. If Council approval is required, some shipping container providers will assist you with this process. Shipping containers are a safe, strong and reliable option for temporary business space but it is important to follow some basic safety precautions when transporting, installing, entering and using them. A detailed safety guide can be found here. A variety of container sizes are available to accommodate differing space requirements. For a restricted footprint, containers as small as 10ft (3 metres) are available. With a 1.9 metre servery, high strength security shutter and end barn doors, these are ideal for kiosks, juice bars and ticket booths. If you’re looking to create a trendy café, wine bar or stylish retail store, a 20ft (6 metre) container is likely to be more suitable. Depending on the provider, these can be fitted with heavy duty marine grade flooring, cold room panel ceilings and high security features such as dual opening end doors with lock rods and a padlock box to prevent access with bolt cutters. 20ft containers can also be provided as Outdoor Rooms with wide glass sliding doors that are perfect for showcasing merchandise or servicing customers. One of the major advantages of shipping container solutions is that they are easily and cost-effectively able to be modified for specific business needs. Whilst standard options are available with benchtops, serveries, power, ventilation, water, smoke detectors and lighting, additional modifications and upgrade options are extensive. Shipping containers can even be stacked or joined to create a building space uniquely suited to individual needs. For any business wanting to stand out from the crowd, visual branding of the building premises is essential. With a containerised solution, the opportunities for expressing your brand are both diverse and cost-effective with many colour options, wall coverings, flooring and interior finishes available. The popularity of containerised building solutions seems set to continue with new and exciting products being developed for specific industry applications.